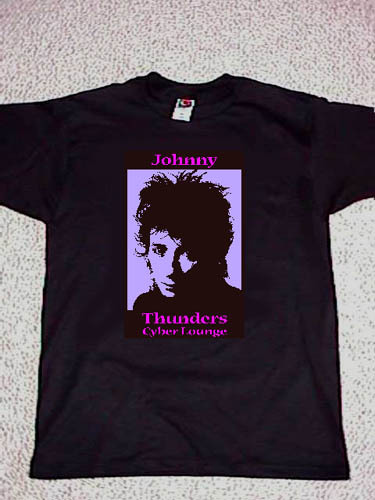 The official Johnny Thunders Cyber Lounge T-shirt. Buy a couple and help to support the JTCL. There is no advertising on the site so this is the only way I raise money to pay for the Internet costs. Here are some links to other places that JT/Dolls stuff for sale. These shirts are 100% cotton, Fruit Of The Loom 'heavy' quality - black of course. The front features the image of saint Johnny in 2 colors. Click here to see a photo of the front. 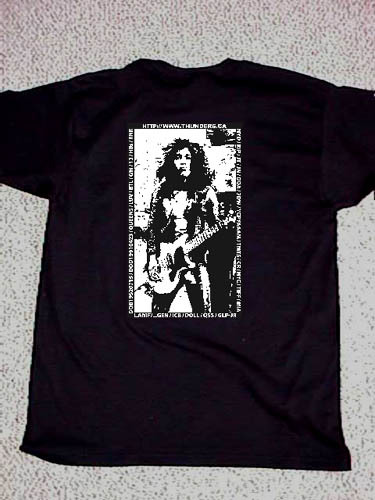 On the back is the wild Mr. Thunders in black and white. Click here to see a photo the back. Available in size SMALL, MEDIUM, LARGE and X-LARGE. You can pick one up for only $17.00 (U.S.) plus shipping (see chart below). Make sure you specify the size you want. Send payment in U.S. funds. Include the price of the shirt ($17.00 each) plus shipping costs. Money orders preferred. I can accept cheques from U.S. and Canadian customers only. Include your email address so I can let you know your order status. Send me email if you have any questions about the shirts.